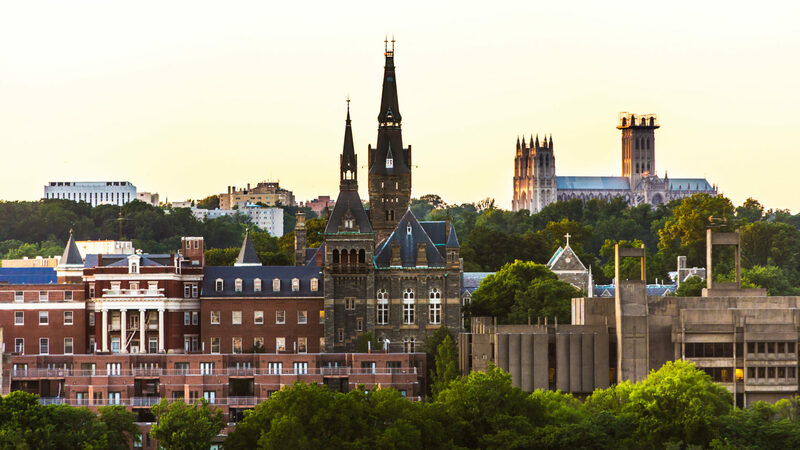 Georgetown University has a bold plan for cutting greenhouse gas emissions: by later this year, it will get nearly half its electricity from solar power. However, building the new solar farm in Charles County, Maryland to power the university will require clear cutting 210 acres of forested land. “I’m very much in favor of solar, but the solar needs to be properly sited,” says Bonnie Bick, a self-described forest activist, and the political chair of the Southern Maryland Sierra Club. She wants Georgetown to reconsider the solar project, and find a location that wouldn’t involve removing hundreds of trees. The site in question is in Nanjemoy, Maryland, on a peninsula that juts into the Potomac River. The area is covered with forests and dotted with a few active farms. Georgetown officials defend the project. “The proposed offsite solar project would reduce greenhouse emissions equivalent to planting more than 429,000 trees, which is the amount of carbon sequestered by approximately 30,000 acres of forest,” said a university spokesperson in a statement, declining an interview. Georgetown is contracting with the solar company Origis Energy for the project. Origis will build the solar farm and sell the energy to the university under a long-term power purchase agreement. Edwin Moses, who is overseeing the project for Origis, says the math is clear, in terms of carbon emissions and climate change. The solar project will produce 32 megawatts of energy, roughly equal to the electricity needed to power 4,400 homes. That clean energy will displace electricity produced by burning fossil fuels. “Origis is extremely confident the tradeoff is a good one,” says Moses. In D.C. and Maryland, 18 percent of electricity comes from coal, 38 percent comes from natural gas, and most of the rest comes from nuclear, according to the Environmental Protection Agency. Renewables account for less than 5 percent of the region’s energy mix. But Bonnie Bick says the project creates a false choice between clean energy and trees. “The question is not forest or solar, it’s where is the proper place to install solar?” Bick says. She suggests that Origis and Georgetown could find a better location, one that isn’t covered with forest. Forests, after all, have value beyond just sequestering carbon — they’re also valuable habitat for birds and other wildlife. The Nanjemoy Peninsula is designated an “important bird area” by the Audubon Society because it contains “a large block of contiguous forest.” The peninsula is 81 percent forest, 11 percent agricultural land and 4 percent wetland. It is home to a “highly diverse assemblage” of birds that need large, connected forests to successfully breed, according to the Audubon Society. “We maximize our benefit with solar when it is placed on a property of low value, such as a capped landfill,” says Bick. Another suggestion: couldn’t Georgetown put panels all over its campus? Edwin Moses says that smaller, scattered solar installations are much more expensive. He says the site in Charles County is a good one. The land in question is zoned for agriculture, and has been periodically logged in past years. “The land is already subject to timbering,” says Moses. The Maryland Public Service Commission has already approved the solar project. The Maryland Department of Environment scheduled a hearing for Feb. 27 in Charles County, after local activists raised concerns. FILED UNDER: DC, Energy, Environment, Local, Maryland. September 18, 2017 – Georgetown and Origis Energy USA today announced a power purchase agreement to develop a 32.5-megawatt offsite solar power system that will provide almost 50 percent of campus electricity needs and help the university fulfill its sustainability mission. The project reinforces Georgetown’s June 2017 announcement with other leading American universities reaffirming support of the Paris Agreement on climate change and the transition to a clean energy economy. It also significantly contributes to Georgetown’s ongoing effort to reduce greenhouse gas emissions from campus operations. Once the solar power system, developed, built and owned by Origis Energy, is constructed in La Plata, Maryland, it will provide for nearly half of Georgetown’s electricity load for campus operations. “This strategic partnership with Origis supports Georgetown’s carbon footprint reduction goals while providing long-term energy price stability,” said Robin Morey, vice president for planning and facilities management. Pending approval from the Maryland Public Service Commission and local permitting, the off-site solar facility will be located on 518 acres in Charles County, Maryland. The Origis Energy design calls for the use of approximately 105,000 solar panel modules and will interconnect to the South Maryland Electric Cooperative transmission system. The project will create approximately 200 jobs during construction, which is anticipated to start in early 2019 and be completed by summer 2019. It is also expected to reduce carbon emissions equivalent to 28 million pounds of coal or planting over 600,000 trees – the amount of carbon sequestered by approximately 30,000 acres of forest. Throughout the term of the solar project’s Power Purchase Agreement (PPA), Origis Energy will support undergraduate scholarships for students with demonstrated financial need. The scholarship initiative is part of the Origis Energy Foundation project to create philanthropic programs suited to the needs of the communities in which the company’s solar installations are constructed. “We are grateful to the Origis Energy Foundation for its generous support of our academic mission, which includes admitting the most qualified students regardless of their ability to pay,” Morey says. Since the late 1970s, Georgetown’s financial aid policies meet the full need of eligible students – regardless of their ability to pay – through a combination of grants, scholarships, employment and loans. The new power purchase agreement follows a spring 2017 agreement with Community Renewable Energy (CRE) to install the largest rooftop solar system installation in the District of Columbia to date. The on-site solar panels, in construction on six buildings this academic year, also will increase the university’s sustainability efforts and reduce costs as well as serve low-income residents in the city. CRE will own the panels, environmental attributes and any incentives the system may provide, while Georgetown will use the power at a guaranteed price. A portion of the revenue generated by that solar project will create a “community investment fund” to support clean energy projects in low-income areas of the District. Georgetown joins a group of leading universities across the country to reaffirm its commitment in support of the Paris Agreement on climate change – continuing its work toward slowing the rise in the global average temperature and transitioning to a clean energy economy. A major solar panel project to be installed on six buildings at Georgetown this summer will increase the university’s sustainability efforts, reduce costs and serve low-income residents in the city.